The voice of the FruitPhonics gang. Discovering phonemes in the glade. Phonics based methods, sometimes known as 'synthetic phonics,' have proved to be the most effective form early literacy tuition for the majority of children. The key to 'Phonics' success is the rapid acquisition of the basic phonemes (all 44) and a solid foundation of phonological skills. (recognising the phonemes components of spoken language). This requires effort, application, and teaching expertise, but success carries huge benefits - and it can also be a great deal of fun. With only the forty four phonemes plus about twenty regular 'blends' and about one hundred high frequency words, a child has access to 50% of the vocabulary in all books. Through their crazy antics in the Glade, the Fruitphonics gang make the process of learning to read both fun and productive. Our friends in the glade interactively lead children through their learning paths with a smiles and a load of laughs. 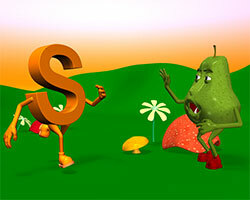 While it may develop into a real time online world for learning, FruitPhonics is not a 'Phonics Programme.' Through multi platfom video, real time animation and innovative design, we aim to create an inspiring learning environment for children and supportive tools for parents and teachers. It's their world, and FruitPhonics is designed to connect, inspire and support literacy progression for all children no mattter which flavour of 'phonics programme' they follow. Young children love 3D animation and interactive activities. FruitPhonics gives them high quality 3D animation, humour, music and the powerful interactive capabilities of our platform. Character animation has the capacity to elicit a powerful emotional response from its audience. This makes it an ideal media form to motivate students while providng a powerful medium for the delivery of information and the expression of ideas. FruitPhonics provides a rich and immersive environment supporting a wide range of phonics based learning programmes. Phonic Fun for serious literacy progress. We have created a childrens animation in the classic style and woven it into our real time platform, adding all of the functionality of a browser environment. The result is a powerful and effective multi platform experience for modern families. Children need to learn the phonic basics quickly. With FruitPhonics they can have fun, while interactively engaging with the gang and their adventures in the Glade. Through a range of activities children can learn while playing, learn individually, learn together with teachers, classmates, or at home, because parents can play too. With phonics to go, the FruitPhonics adventure can go wherever the family do, loaded onto mobile devices, a family can learn together whenever to time is right. After all, childrens enthusiasm and curiosity cannot be timetabled. Real time 3D animation and graphics offer young learners simple, intuitive 3D interfaces that make navigation a breeze. Navigation is also structured to reinforce learning and develop higher level thinking skills. The real time environment encourages immersion for extended periods of interactive exercises. It's possible to design a huge range of games style exercises and test modes combined with facilites for creative writing to contribute to their versions of the world and character adventures.